What comes to mind when you think of the word ‘spread’ at Thanksgiving? For most people, that word conjures up fond memories of a huge feast. A golden turkey surrounded by Aunt Sally’s stuffing, Cousin Sarah’s sweet potato topped with marshmallows, Ben’s bean casserole, and more. Followed by another spread of desserts. Apple pie a la mode, pumpkin pie, and the ever-popular Grandma’s homemade chocolate cake. Sitting around the holiday table with loved ones can be uncomfortable—in more ways than one. We pig out on the food. And wind up stuffed. Uncle John raises awkward conversations. And we wish we could crawl under the table. As Thanksgiving approaches, a mother raising a child with mental illness (MI) might have additional things on her mind. Instead of enjoying fond memories of a food spread, some of us fight emotions. Fear spreads as we conjure up thoughts of worst-case scenarios. Will my child with MI be stable enough to join in the celebration? Will other family members be accepting of him? What if his symptoms emerge? How will others react if he doesn’t eat? How will I respond to probing questions? Can I bear seeing him sitting in a corner all alone another year? Most Americans pause to thank God on Thanksgiving. Surely, those of us raising kids with MI have a list of praises for God at this time. That He’s protected our own sanity, if nothing else. Wouldn’t it be a relief if Thanksgiving was also a time to send prayers for those who are suffering? Lincoln was referring to the suffering of the nation faced with civil strife. He invited citizens to pray for ‘the full enjoyment of peace, harmony, tranquility, and union.’ Those same words could be applied to us. I thank You for how You’ve provided for mothers raising children with MI. For those who have seen Your hand in their lives and who have seen improvement in their children. I’m grateful for Your protection. For each mother reading this, I now ask that You give ‘full enjoyment of peace, harmony, tranquility, and union’ in her home. May Your love spread in the hearts of each family member. Bless each one with a truly joyous Thanksgiving Day. In Jesus’ name, Amen. God used that stubborn maple tree to draw me closer to him. Here’s how. Each year we get our gutters cleaned out. But only after the trees surrounding our house have shed all their leaves. Every tree in our neighborhood had released their leaves. Except the one closest to our house. Our gutters couldn’t be cleaned until all the leaves on that tree were gone. Why did I become so frustrated with that maple tree? Because it represented one more thing I couldn’t control. Health is one thing we can’t fully control. Not the health of our loved ones, or our own. Those of us raising kids with mental illness (MI) have learned that lesson the hard way. In addition to our son’s MI, my husband’s health made me feel a bit helpless. His gallbladder needed to be removed. As we waited for the day of surgery, I didn’t stray far from home. At any moment, he could suffer another gallbladder attack. My imaginary jar of control was filled to the brim. I was successfully handling daily chores—Howie’s and mine. Howie and I controlled what he ate, being careful not to add any fat to his diet. I was even able to control how much attention I’d give to my own physical symptoms (growing fatigue, worsening back pain, annoying runny nose and sore throat…). God helped me ignore all my own pain as He gave me endurance. The tree became the straw that broke my control container. I couldn’t check off ‘gutters cleaned’ from my to-do list until that tree cooperated! Why are you hanging on for so long? Let them go! Those two words, “hanging on” echoed in my mind. Hanging on can be good or bad. I wondered if I had been hanging onto thoughts of the life I dreamt for Chris. Before his MI hit, he seemed on track to lead a fulfilling life. First there’d be college and then a job. Followed by life with a family in a suburban home. God had other plans. I wondered if I’d fully accepted God’s plan for Chris. Then I reminded myself of God’s faithfulness. He had enabled Chris to graduate from college. Since then, Chris has remained active. “When my life was ebbing away, I remembered you, Lord, and my prayer rose to you, to your holy temple. Those who cling to worthless idols turn away from God’s love for them. But I, with shouts of grateful praise, will sacrifice to you. What I have vowed I will make good. I will say, ‘Salvation comes from the Lord.’” (Jonah 2:7-9). When we feel our life ‘ebbing away’, it helps to remember our Lord and cry out to Him. Our Creator, who kept Jonah alive in a fish, will sustain us. He’s the God of nature who controls all things. Who has power to do more than we can imagine. Who loves us more than we know. So here’s the good part of hanging on. When we hang onto God, we can relinquish all control to Him, trusting that He’ll care for us and our family. Maybe we can’t relate to being swallowed by a great fish. (I can’t remember the last time I heard about someone on the news surviving such an ordeal!) It’s easier to envision wandering in a wilderness. In Psalm 63 we read about how David clung to God when he was in the wilderness. “You, God, are my God, earnestly I seek you; I thirst for you, my whole being longs for you, in a dry and parched land where there is no water. I have seen you in the sanctuary and beheld your power and your glory. Because your love is better than life, my lips will glorify you. I will praise you as long as I live, and in your name I will lift up my hands. I will be fully satisfied as with the richest of foods; with singing lips my mouth will praise you. On my bed I remember you; I think of you through the watches of the night. Because you are my help, I sing in the shadow of your wings. I cling to you; your right hand upholds me” (Psalm 63:1-8). Hang in there and cling to God. What’s the point of all we do? No one thanks us for showing unconditional love to our child who has mental illness (MI). No one knows our heartache. Or our loneliness. What keeps us going? How do we continue to support our child with little or help or no recognition? We don’t see the fruit of our labor like other moms raising kids without MI. There are days when discouragement sets in. Thoughts of our child’s future taunt us. Will he ever be fully healed? Will joy and peace ever return to him? Will he ever find his place in life? We’re tempted to shake our fist at God and cry, “Why do you allow this misery to continue?” How is it possible to resist the temptation to lash out at God? By remaining in His Word and clinging to His promises. How do we face another day? What does keep us going? Certainly we’re driven by our steadfast love for our child. We’re also propelled by the rewards God promises. 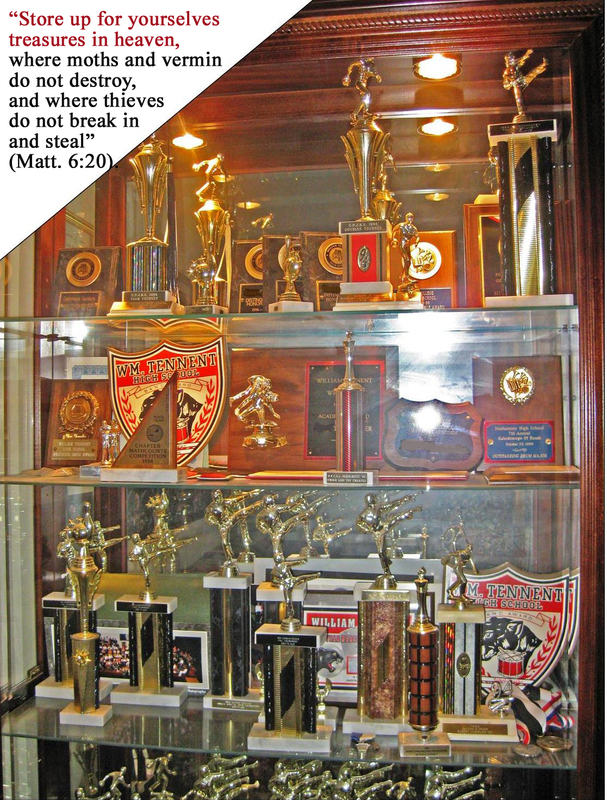 “Store up for yourselves treasures in heaven, where moths and vermin do not destroy, and where thieves do not break in and steal” (Matthew 6:20). MI tempts us to abandon our faith in God. For those who trust in God, Jeremiah offers encouragement. “… ‘your life shall be as a prize to you, because you have put your trust in Me, says the Lord’” [Jeremiah 39:18b (NKJV)]. I can’t imagine dealing with MI without access to a real and living God. When earthly reality gets shattered, I can rely on the Truth that God exists. He not only invites us to turn to him in our distress, but He promises to reward us for doing so. When things get tough, it helps to have someone cheering us on. Teaching was especially tough for me when multiple sclerosis (MS) hit. My husband kept assuring me, “You can do this.” God reassures us that we can endure with His help. He doesn’t say, “See if you can make this for one more year.” That would sound IMPOSSIBLE. He calls us to trust Him one day at a time. Just like when He told the Israelites wandering in the wilderness to trust Him for manna for each day. For those of us who trust him afresh each morning, He promises a reward. Is that a picture of your efforts? Do you continue to do all that is within your power to help your child, even though deep down inside you suspect it won’t make a difference? James tells you that you will be rewarded for persevering under trial—for ministering to your child in so many ways and for such a long time. Running the race God has set before us involves strenuous effort, self-control, and concentration. In the face of MI, we focus solely on fixing our child’s problems. Like a marathon race, our track requires strenuous effort. We can say we ended the day victoriously if we devoted strenuous effort to seek God in the trial. Ours is a daily battle of fighting fears, self-pitying thoughts, and anger. When circumstances take a turn for the worst, I’ve had to deliberately interrupt my own negative thinking. Why must I have to face this AGAIN? I’m just so tired of—No! Dear Father, put a hedge about my thoughts and emotions. Block out any negative thoughts. Help me deal with this situation. Give me steady emotions and Your wisdom. We can exert self-control. Self-control that will be seen in our gentle responses to our child, regardless of his actions. Restraint that doesn’t come from self-will, but from the Holy Spirit in us. We can demonstrate a constant concentration on our goal. Many of us function with a clear focus on heavenly matters, in addition to life’s pressing concerns. Yes, we help our child find good treatment, compassionate therapists, and a purpose for their life. In the midst of it all, we also remember to invest Truth into his heart. We share verses and pray with him. And we remind him that God’s power is greater than any problems. We reassure him that God is still on the throne. Run your race with renewed confidence. God will enable you today and reward you for all eternity. He’ll give you treasures in heaven and a crown of life. That will truly be the best payoff ever! We all know what to do about a shaken can of soda. Let it settle before opening it. Otherwise it will explode and foam will shoot out. Do you feel like a shaken can of soda? Is your heart like that carbonated drink? Unsettled. Does it first have to settle before you open up and talk about what mental illness (MI) has done to your child and to you? Are you afraid that if you release your emotions, raw emotions will gush out? And you may never stop crying. We want to feel settled. More than that, we want peace. Peace for our child. Peace in our home. Peace in our heart. I gravitate to verses about God’s peace. Recently I discovered one tucked at the end of 2 Thessalonians. “Now may the Lord of peace himself give you peace at all times and in every way. The Lord be with all of you” (2 Thessalonians 3:16). Can you guess what caught my attention? “In every way” I yearn to have peace at all times. But I never considered having peace in every way. After checking several commentaries, I learned how God can give us peace ‘in every way.’ It means we can have peace in every way we are unsettled. An infant sleeping is the perfect picture of peace. Back when our son, Chris was first born, I loved watching him sleep. I’d gaze into his precious face and catch a glimpse of serenity. If only I could have frozen those moments in time. Those were days when Chris’s life was filled with peace. On occasion I dare to reminisce—to recall carefree days before MI hit. It’s painful to think of what MI did to my dreams for Chris. Hopes for an untroubled life were dashed by the harsh realities of illness. Peace was snatched away. Yet I still sometimes entertain thoughts of happier days when Chris was young. Strangers often observed, “He’s such a happy baby.” And he was. Etched on my heart are snapshots of family fun. Like times when Chris climbed a tree with his brother or played a board game with his father. But I can’t linger in the past too long. Because my joy gets sucked into the quicksand of sorrow. I never expected his life to turn out this way. I just wanted him to be happy and have a peaceful life. I see his strained smile and know that, “Even in laughter the heart may ache” (Proverbs 14:13a). Then I remember the God of all peace can fill Chris with true contentment. Hang onto promises God gives us about peace. That’s what helped me through times of greatest trials in Chris’s life. I clung to promises about peace like, “The peace of God, which transcends all understanding, will guard your hearts and your minds in Christ Jesus” (Philippians 4:7). Focus on an image of divine peace. Imagine laying your head in the palm of God’s hand. Picture yourself resting in the Creator’s mighty hand. 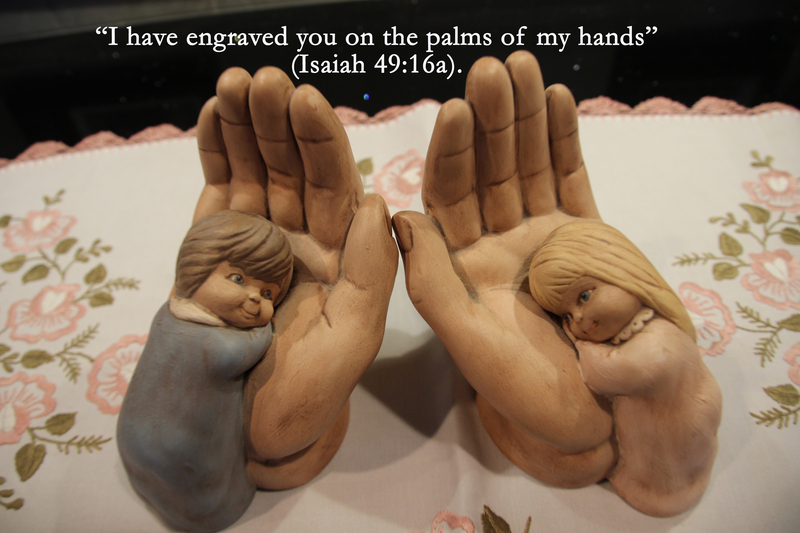 The King of all kings has said, “I have engraved you on the palms of my hands” (Isaiah 49:16a). “Let everyone bless God and sing his praises; for he holds our lives in his hands” [Psalm 66:8-9 (TLB)]. Human hands can’t fix MI. But the mighty hand that created the universe can handle your life with great care. Hear Isaiah whisper, “This is what God the Lord says—the Creator of the heavens, who stretches them out, who spreads out the earth with all that springs from it, who gives breath to its people, and life to those who walk on it: ‘I, the Lord, have called you in righteousness; I will take hold of your hand’” (Isaiah 42:5-6a). He will guide you through your journey. A journey that demands peace. Reach out to Him and He’ll handle you with care.